128 pages; quality trade paperback (softcover); £9.95 + P & P £2.25 (UK only). For other countries please ask first. Available to buy in the Heritage Centre. A rare insight into the history surrounding one of the oldest surviving charter fairs in the land, from the wool trade, mediaeval lords, legislation, and pony fairs, to modern day trading. This is an exciting new book offering a rare insight into the history of one of the oldest surviving charter fairs in the country. From its first pages it provides a thoroughly interesting read; it is well researched, spanning nearly eight centuries of trading and country life, and 2008 celebrates the 750th year of St Luke's Fair of Bampton, Devon. Introducing the subject of 'what is a fair' this book moves rapidly on to mediaeval tolls, why they were charged and by whom. Another section introduces 'fair trading', legislation, and the efforts made by the mediaeval kings to prevent fraud. In particular the book shows a little known perception of the ancient church and why it wanted the rights to the charter of the fair, and the lengths it would go to trying to outwit the devious Norman lord of the manor, John Cogan. Successfully creating a social context for the fair the book shows how the first Norman lord, Walter de Douai, was to play an inadvertent part in the fair's long term success, and for the next six centuries the wool trade, and sheep farming, was to provide livelihoods for many workers within the town and the fair was the scene where all these people came together. Finally the book traces the fair's exciting existence as a pony fair when hundreds of ponies pranced through the streets. If there is one book you wish to read about charter fairs, this is it. Frances Collier-Lovell is a native of the west country and as such speaks with a particular authority when writing about a region in which she has versed herself in all aspects of its poetry, people, history and social events. She has produced a very exciting book which is the product of its broad sweep of narrative concerned with the history of Bampton in Mid Devon, a sweep that ranges from Anglo Saxon times to the age of the internet and global communication and its impact on this tiny town. However, the attractiveness of this breadth of vision is especially aided by her sympathetic focus on key figures and their trials, tribulations and dilemmas - from those coming to Bampton as a result of their association with the Norman Conquest, to farmers and merchants and the trade in Exmoor ponies, to the miners, and soldiers departing from Bampton to the First and Second World Wars, and to the personalities involved in responding to the pressures on Bampton during the early years of the third millennium. Her book is the culmination of many years study in the field of literature, medieval studies and theology in universities at the forefront of such scholarship and research. Her award winning poem 'Going Home' concerned with quarry workers at Bampton represents her deep understanding and empathy with the characters and their activities which are so reflected in her book. 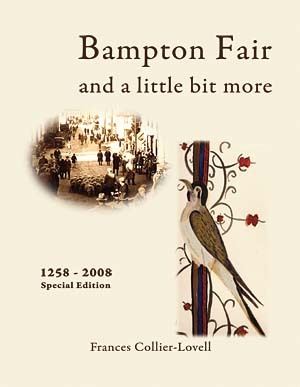 To purchase your copy of 'Bampton Fair and a little bit more' please send an email detailing how many copies you would like. If you would like a signed copy please mention this when you place your order.